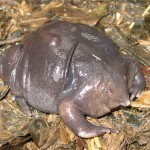 You may have already seen the picture of this unusual creature around on Facebook and wondered what it is. 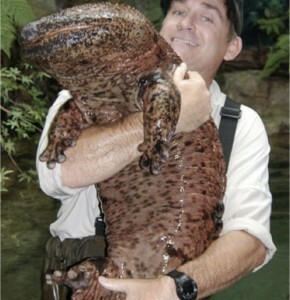 Well, I looked it up, and it’s a Japanese Giant Salamander. It is actually rare to see one of these, since it lives underwater and is only active at night. 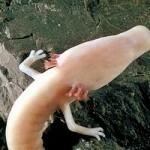 This particular Giant Salamander probably came out of the Kamo River in Kyoto, Japan. It was witnessed along a popular footpath along the river. Officials think the giant salamander may have been forced from its natural habitat to go find its nesting burrow. 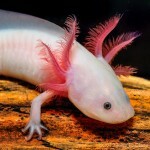 (During mating season, sexually mature adults go upstream into the mountains to spawn and lay eggs. The male releases milt over the eggs laid by the female. Larvae emerge from the fertilized eggs, and lose their gills once they metamorphose into adults.) The way to the burrows may have been blocked off by modern-day concrete barriers put in place for the purpose of flood protection and enhanced irrigation. Police were able to lead it back to water. It is the second-largest salamander in the world, being only surpassed by the very similar and closely related Chinese giant salamander. The Japanese giant salamander is entirely aquatic and nocturnal. 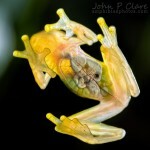 They only breach their heads above the surface to obtain air without venturing out of the water and onto land. When threatened, these giant salamanders can excrete a strong-smelling, milky substance with an odor resembling Japanese pepper (hence its common Japanese name, giant pepper fish). 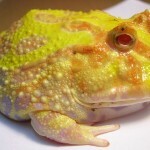 It has very poor eyesight, and possesses special sensory cells covering its skin, running from head to toe. These sensory cells’ hair-like shapes detect minute vibrations in the environment, and are quite similar to the hair cells of the human inner ear. This feature is essential for hunting because of its poor eyesight. The Giant Salamander feeds mainly on insects, frogs and fish. It can grow to be 5 feet long (1.5 m). It lacks natural competitors and is a long-lived species, with the captive record being an individual that lived in the Natura Artis Magistra, the Netherlands for 52 years. 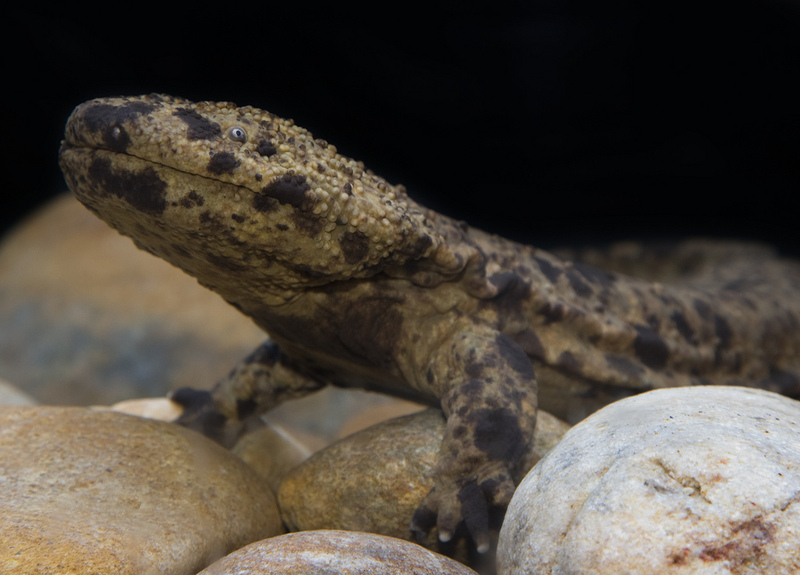 In the wild, the Giant Salamander may live for nearly 80 years! The Japanese giant salamander is threatened by pollution, habitat loss, and overcollection. It is considered near threatened by IUCN. It can be found on the islands of Kyushu, Honshu, and Shikoku in Japan. In the past, they were fished out of rivers and streams as a source of food, but hunting has ceased because of protection acts. The species was designated as a special natural monument in 1951, and has been protected. You might also like: Did You Hear About the Huge Alligator Snapping Turtle Rescue?